Congrats! 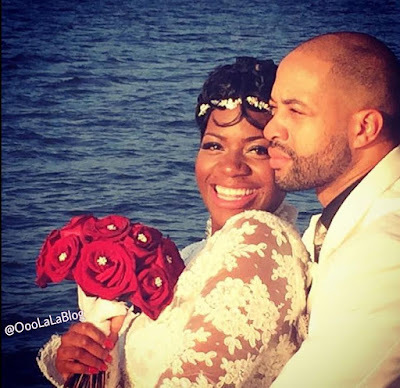 Fantasia Barrino & Kendall Taylor Tie the Knot - Ooooooo La La! The American Idol winner and her fiancé, Kendall Taylor, wed in an intimate ceremony in Charlotte, NC, over the weekend. "Those who really know me know that I LOVE Water.. Can you see it? How Happy I am.. This Man.. God made him just for Me and me Just For Him.. This Man.. Covers and prays for me and my children EVERY morning.. This Man.. Loves My Father in Heaven and his name is God.. This Man allows me to just be a woman.. No more Hurt because King Kendall will never let that happen.. I'm off to just kiss, Hug and play in some water with This Man.. Look at Him in the pic YEP!! HE COVERS ME.. Be Happy with me you guys cause I've been thru SOOOOO much. Some stuff was my wrong decisions but all I ever really wanted was this.. Real Love. This Man and this smile is real... Later you guys 😘 bye bye for a while.. God did not forget about me...."
Fantasia spent years in an on-again, off-again relationship with Antwaun Cook, but now she has found her happy ending with Kendall.